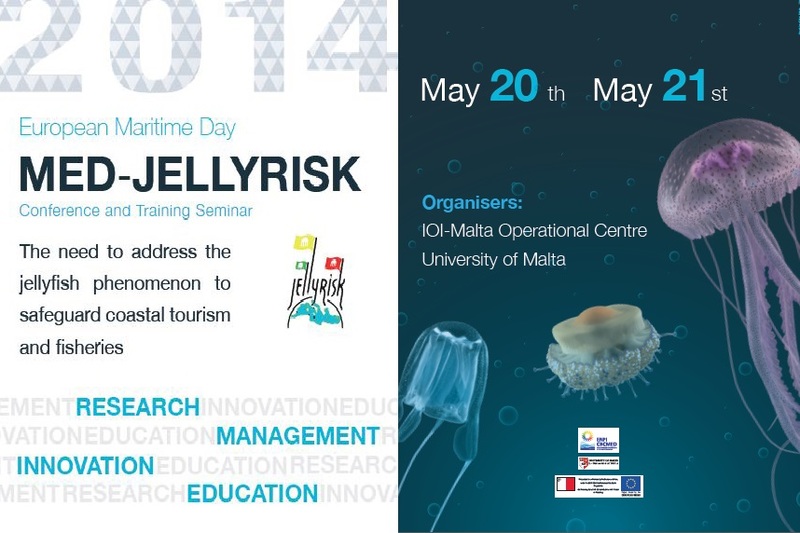 The two-day MED-JELLYRISK conference organised by the International Ocean Institute-Malta Operational Centre (IOI-MOC), through Senior Lecturer Dr. Alan Deidun, on the impact of jellyfish blooms on coastal tourism and aquaculture and on the diverse array of innovative tools being developed to address the phenomenon has successfully taken place on the 20th and 21st May, in commemoration of the European Maritime Day. The conference was opened by MTA Chairman Dr. Gavin Gulia and featured keynote speeches by world-renowned experts including Prof. Bella Galil, Prof. Jennifer Purcell and Prof. Stefano Piraino, as well as stakeholders from the local tourism industry, such as SCUBA diving clubs, beach managers, beach lifeguard groups and hotel operators, as well as representatives from the aquaculture industry. During the first day of the conference, an overview was given of the diverse mathematical modelling tools being developed to predict the occurrence and dispersion of jellyfish blooms, of the MED-JELLY smart phone application being released locally (this can be downloaded for Android phones from the following link: https://play.google.com/store/apps/details?id=jelly.med.mobileapp and for iPhone from the following link: https://itunes.apple.com/LY/app/id868757617?mt=8 ) and also of the novel biotechnological products being isolated from jellyfish, such as cosmetic and nutrition supplement ones. Those present were also briefed about the global impact of jellyfish blooms on coastal tourism, aquaculture and fisheries. 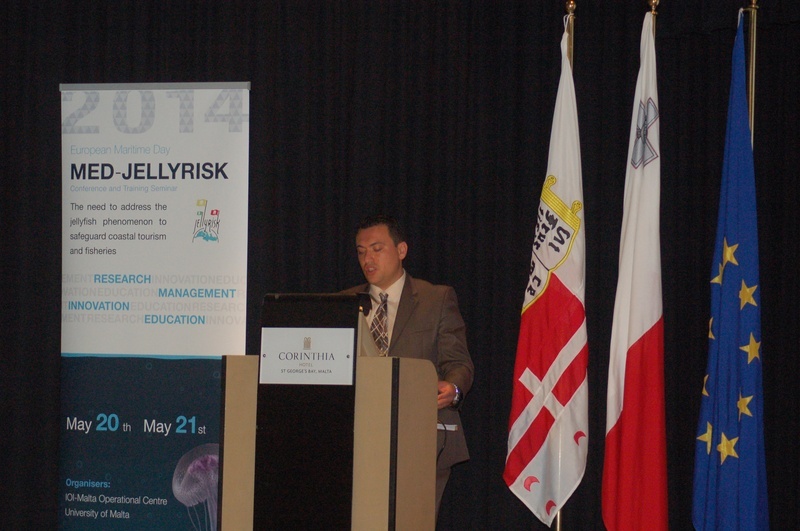 During the second day of the conference, Mr. Mark Zammit delivered a talk on the treatment of jellyfish stings on the beach at St. George’s Bay, where a demonstration of the deployment of the anti-jellyfish net was also given. Those present for the conference were given a booklet with abstracts of all the presentations, a water-proof factsheet which answers the most common questions about jellyfish blooms, a waterproof booklet with scientific advice as how to treat the stings of different jellyfish species and also a pack of 20 postcards featuring most of the jellyfish species occurring in local waters. Those wishing to obtain a free copy of any of these educational tools can send an email to Dr. Alan Deidun on [email protected] or call on 23403704. The University of Malta participates in this project through the IOI-MOC and the Department of Biology. The MED-JELLYRISK Project is funded under the ENPI-CBC Mediterranean Sea Basin Programme 2007-2013, co-financed by the European Union. The multilateral cross-border cooperation "Mediterranean Sea Basin Programme" is part of the European Neighbourhood Policy (ENP) and of its financing instrument (European Neighbourhood and Partnership Instrument - ENPI). The programme is co-financed by the European Regional Development Fund (90% EU funds; 10% MT funds).